You helped us stop the previous application for an inappropriate supermaket development adjacent to Abney Park, which was refused on 3rd April. There is now a new application with very small changes. The application number is: 2013/1583 and 2013/1584. We have spent some time analysing the new proposals, and the short versions is that they are largely indistinguishable form the previous one already rejected by committee. However, we must all object again, if we are to prevent the new application being passed. Here’s what Stokey Local think of the new application. A whole new consultation period began, and formally ended on Wednesday 19 June but comments are accepted up until the Committee meeting (probably 31 July). 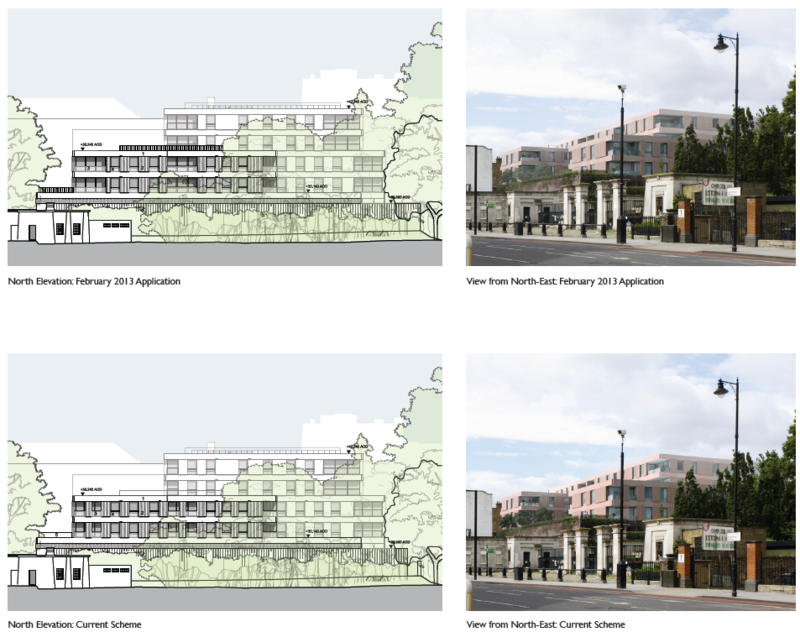 So if you still feel this development is not right for Wilmer Place, it’s important that you write again and ask your friends and neighbours to consider doing the same. You can comment here: http://hackney.hk/2013/1583/comment or you can email planningconsultation@hackney.gov.uk quoting application number 2013/1583. You can also call the planning officer, Steve Fraser-Lim on 020 8356 6377 although we recommend that you concentrate on getting your comments in in writing. The principle changes are: setting back the two storey podium wall by 1 – 2 m on the West but not the North (Cemetery Gates) side. Setting back the residential blocks by 1- 3.2 m. Increasing 3/4 bed units from 13 to 16. Some design changes. The development has been reduced in scale at the back only, and the perimeter has been set back a modest amount. We believe these changes are minimal and do not address the reasons for refusal of the previous application. Indeed, it would be potential perverse for the Council to now pass this application having rejected the previous one (but stranger things have happened). Please make your own comments in your own words but see our formal response for the objections we think will be relevant and effective. They are based on Hackney’s “Core Strategy” and other supplementary planning documents. Spot the difference: changes to the most visible and damaging view to the streetscene are subtle. The most important thing you can do at this stage is to get your objections into the Council (and encourage others to do the same). However, we believe that this will be going to committee on Wednesday 31 July (so please put the date in your diary now, and join us at the town hall to see that justice is done). We have leafleted every home in the neighbourhood, with further calls for help and support needed. We need to ensure that there are more objectors to this application than there were to the last, so please, tweet, facebook, email and speak to people about this proposal. We have already shown what we can do when we get our community organised, now lets get ready for ’round two’! We do not need a large supermarket in the area and it is a totally unsuitable place to situate one and the traffic would be a nightmare.